Create your online courses in a few steps! Your courses. Your content. Your audience. Create online courses quickly and easily! Coursify.me is Free and you can test the platform quickly with your real content! Your name. Your logo. Your image. You can customize the look of your courses quickly by choosing a color scheme, putting your logo your cover image and links to their social networks. Your School. Your programs. Your students. Manage your courses and to offer its students an optimized learning environment, with progress control and support each lesson via comments to ask questions. 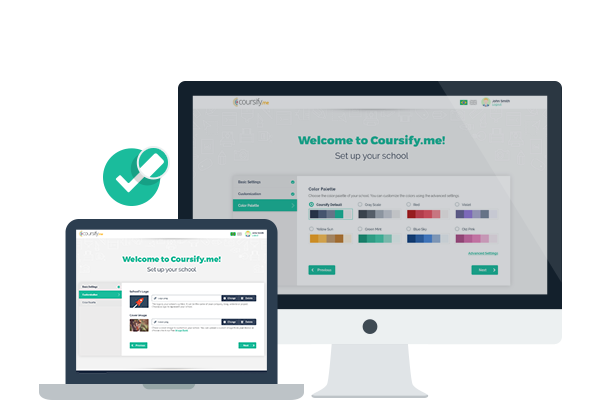 The Coursify.me has an easy to use builder for you to create your online school in a few steps. Choose the name, slogan and URL of your school, upload your logo and choose a cover image. Choose colors that match your school. There are 8 customizable color schemes for you to choose from. Create your online courses with an easy and intuitive builder, which allows you to view how your course will look in real time. 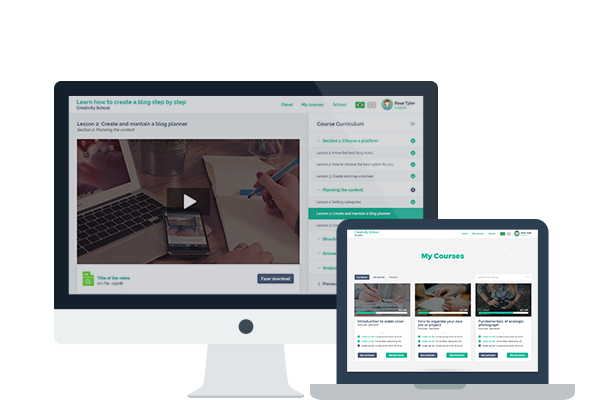 The Coursify.me allows you to structure your online course into sections and lessons. Add useful information to your online course page, such as video presentation and testimonials from your students. Easy customization of the visual identity of your online courses with logo, images and custom color scheme. Students can manage their online courses and monitor their progress through the dashboard. Students have a restricted area optimized to learn, follow the lessons and ask questions. The Coursify.me hosts your online courses with redundancy and backup for you to have a secure and reliable environment. Organize your online courses into modules with sections and lessons to facilitate learning. Choose a friendly address to your online school in the Coursify.me domain or configure your own custom domain. Integrate and import content from other platforms such as Dropbox, YouTube and Vimeo. Receive your payments securely via PayPal, in the currency of your choice. Follow the growth of your online courses through charts that show the number of sales. Manage the students of your online courses and track their progress and performance in real time. Join the comments section in each lesson to help your students grow their knowledge and networking. Count on a system entirely responsive, with optimized support for desktop, tablets and mobile. Support for the most popular browsers in the market, such as Google Chrome, Safari, Firefox and Internet Explorer. Your online courses are optimized for SEO (Search Engine Optimization), making it easy to be found on Google. Host as many online courses as you want without paying anything for it. 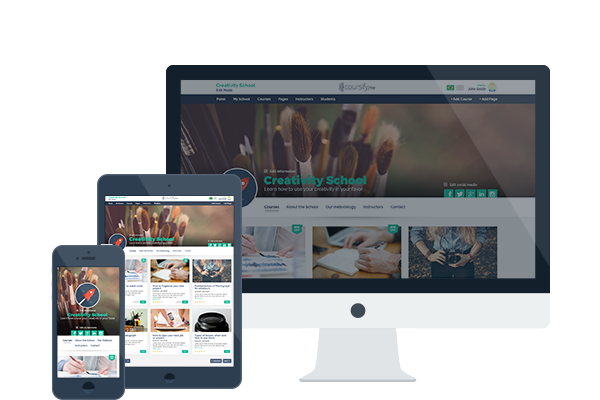 Enter your logo, images, colors and style to create an online school with your identity in a few minutes. Import text, images, videos and other content from Dropbox, YouTube, Vimeo or from your computer. Provide access to your courses to anywhere in the world easily and securely.